The Reserve Bank as expected kept the Official Cash Rate unchanged at 1.75% in Governor Graeme Wheeler's last interest rates decision in the job. Perhaps more surprisingly, in its latest Monetary Policy Statement the central bank retained its previous forecasts that interest rates will start to rise from late 2019. Also worth noting in the forecasts are that economic growth from next year onwards is now expected to be slightly stronger than previously, inflation is forecast to be weaker and the Kiwi dollar is forecast to be stronger. Late last year the RBNZ implemented a 40% deposit rule for housing investors to try to take heat out of the housing market. The housing market has indeed softened this year. In his last press conference as Governor, Wheeler dead-batted questions about his time as Governor and meeting inflation targets by saying he would be giving a speech at a later date at which such questions would be covered off. Wheeler said house price inflation continued to moderate due to loan-to-value ratio restrictions, affordability constraints, and a tightening in credit conditions. Given recent soft inflation data coming out, some economists had expected the RBNZ to possibly push out the timing of rate rises. The Kiwi dollar rose slightly on the news and was US73.5c a short time ago. ASB chief economist Nick Tuffley said the RBNZ’s OCR outlook was not as ‘dovish’ as expected. "We had seen a good chance the RBNZ would push out the point at which its forecasts showed increases." Tuffley said the RBNZ's inflation outlook in its latest forecasts now dips more sharply in 2018 (to 0.7% yoy), reflecting recent food and fuel price movements. The longer-term view is roughly similar to the May forecasts. 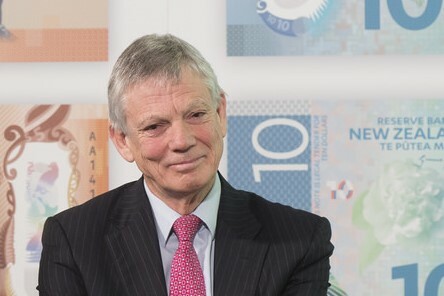 Comments made by the Governor, Tuffley said on the New Zealand dollar were largely similar to those made at the time of the last Monetary Policy Statement in May, though rearranged to put more weight on the need for the NZD to boost tradable inflation. The RBNZ has recently put a lot of emphasis on understanding better why inflation has not increased in the manner that its economic forecasting models used historically would suggest it should. The central bank hiked interest rates a full percentage point in 2014 in response to perceived emerging inflationary pressures, which proved illusiory. In the latest MPS the bank says its recent research to understand the drivers of low domestic inflation found evidence of a change in domestic price-setting behaviour over recent years. "Generally, businesses are assumed to set prices using a combination of past inflation outcomes and future inflation expectations as a reference," the RBNZ says. "This research suggests that, in recent years, businesses have been placing a greater weight on past inflation when setting prices. "In response, the Bank has adjusted its forecasting models of inflation to better capture the role of past low inflation weighing on current pricing decisions. "This has helped remove the negative forecast errors in non-tradables inflation observed between 2012 and 2015." The RBNZ says the implication from its research is that recent weak pricing dynamics are likely to act as a headwind to inflation over the forecast horizon. This suggesed that the stance of monetary policy "needs to be more accommodative than otherwise". "There is a risk that price-setting behaviour could be stronger than is currently assumed in the forecasts. If businesses begin to put less weight on past inflation when setting prices, recent low inflation outcomes would weigh less on the outlook for inflation. This would lead to higher inflation as pricing behaviour responds relatively more to economic activity and to expectations of higher future inflation. In this situation, less policy stimulus would be required for CPI inflation to settle near the mid-point of the target band." "Monetary policy is expected to remain stimulatory in the advanced economies" Sorry, Graham, it isn't. Monetary Policy ( shaped by memories of the past that no longer bears any resemblance to today's economies) remains the yoke against which a vibrant market must push. Monetary policy is expected to remain stimulatory in the advanced economies, but less so going forward. A 12 bps rise in benchmark LIBOR seems totally out of reference for a permanent cleaving of the entire global economy. This lost decade began as they might often do, with a miscomprehended whimper, a dismissed signal of great significance because authorities who had for a very long time assured the populace of their power to maintain the status quo never bothered to test whether that was true. When challenged, however, they show themselves not just the naked emperor of the fable, but no emperor at all. All very true Stephen, but it might also be worth remembering that some "don't know what they doings" are doing better than others, lest we fall into the trap of thinking that because nobody knows what they are doing anybody will do. * Argentina ran an inflation rate of 41% in 2016. * Zimbabwe destroyed their currency so that per capita incomes halved in the last decade. * Youth unemployment in Italy, South Africa, Greece and Spain is over 30%. In France it's 24.6% and Portugal 27.9%. So although nobody seems to know how to do anything positive there is a large track negative to the negative side. It has always been easier to destroy than create, especially when it's someone else's money. So we as ordinary folk going about our daily lives know that inflation is benign , and that things are actually quite stable . Rates are not going up any time soon. Is that good or bad news for the economy, which is mainly dependent on dairy, immigration and tourism and yes, house flipping ? "House price inflation continues to moderate due to loan-to-value ratio restrictions, affordability constraints, and a tightening in credit conditions. This moderation is expected to persist, although there remains a risk of resurgence in prices given continued strong population growth and resource constraints in the construction sector." And a certain person seems to ignore to constrains of supply of money (i.e. loans) and affordability. Read the whole sentence, I have capitalised the important bits, like you like it. Er, they did not acknowledge the IMPORTANCE of DEMOGRAPHICS, they noted the RISK. It's a different thing. A prudent person always acknowledges an upside and downside risk, that does not change their underlying message. Now, compare it with your message, which, I take, is essentially "you EXPECT prices to CONTINUE to rise but there is a RISK this PLATEAU will be a month or two longer." It's the equivalent of when a child covers their ears, closes their eyes and keeps shouting "blah blah blah, blah blah blah". Nothing will get through to them, what they're saying is complete nonsense, but keep repeating it anyway just to get attention. I quoted not just a sentence, but the entire paragraph, on housing from RBNZ's News Release this morning. RBNZ has clearly signalled a risk of a resurgence in house prices. Because RBNZ spells this out in its brief News Release this morning, it is obviously considered important by RBNZ. You are one of the people here who prefers to ignore demographics and supply constraints - your angry/anxious comment above proves the very point I made in my earlier post. I won't be commenting further as I'm reminded of the time-honoured wisdom, "Arguing with a fool only makes you look like one". Why did you change your reply - it originally implied that RBNZ assured house prices will increase. You changed it to "a risk of a resurgence" - a big difference. You accuse others of being fools - I think you make yourself look like a fool all by yourself. revisionism is property specuvestor 101. You quoted it, but mis-interpreted the tenor and fundamental message. In post after post you say this is merely a plateau and prices cannot fall far. This flies in the face of the RBNZ expectation. Not one single time have I said there is no risk of resurgence nor told people to ignore demographics. I just repeatedly point to the fundamental issue of affordability and credit bubble issues ... you know, the things the RBNZ highlight first. So stop being a "so you're saying there's a chance" type personality and miss the entire point of the speech. Now that I understand your inability to read tone in message, I am not offended you think my posts are "angry/anxious". Thanks for the addage and being concerned I will appear a fool if I continue to 'argue' with you. What a wonderful present to know you'll no longer be commenting. This is what “markets” really are.... in the 21st century; massively dominated by algorhythmic technology on the one hand and sovereign banker manipulation on the other. Their directionalism is utterly decisive in setting the agenda...The predictions since The Crash in 2008 have been consistently wrong for two reasons. First, they anticipated honesty on the part of the elites, and were thus too pessimistic. Or second, they believed the narrative put out by the elites, and were thus too optimistic. I have been guilty of the first crime. This has taught me to be very wary of the second. Complacency. Home sales are collapsing to historic lows in Auckland, against historically high immigration and historically low interest rates. Cowpat, buyers are waiting for after the election before making a decision. China is going to buy up Auckland after Chinese new year 28 Jan to Feb 3. Five bedroom houses 300sqm in Albany or Flatbush is what Chinese desire. Could you point me to the stats that prove that? Thought I'd check it out myself, to sense check that statement, the best I could find was QV.co.nz. I've had a look over the last election period in 2014 on qv.co.nz, prices apparently grew in Auckland by 2.1% between May and July, same period this year there's been a little downward movement? Is there another site that could show me the downward trend over election time? Undoubtedly, that's correct in the case of many buyers. Further, many markets slow before a General Election - not just housing. Do those stories make you feel better tothepoint? But, its a good thing that there are some people who think that prices will go down hence are shutting themselves off the market - which produces better opportunities for keen buyers in future and more balanced markets. ...and then there are those who believe house prices can only go up. 2002 . We sold 100,000 homes nationally, 36,000 in Auckland. 2002 was an election year. In 2017 on target for only 18,000 sales in Auckland, turnover below 4 percent will start to drag prices down and expose the debt. Looks like the last of the new houses up the road from me just sold, removal truck was there yesterday so not everyone is waiting, they are just getting on with it.Some people here need to look up the word "resurgence" in the dictionary. I was being told by many on here months ago that interest rates were going to increase substantially in the near future. I stated that there would be very little movement in the rates and that is what seems to be playing out doesn't it? In fact the rates are much lower than when I last fixed. Not sure why we have economists making their predictions when most are continually wrong. Its funny that everyone in the world is predicting lower inflation in 2018/2019 ...not sure How but it looks they know something we dont... its all fun though! time to make hay..
Something that hasn't happened is the Fed reducing their bond holdings. They said they'd start a slow sell off but they haven't even started yet. The interest rates aren't changing because the Fed isn't doing anything. Zero dollars have been sucked out of the financial system. Yep ,....that dollar is very scarce really -- and they said it is going to take time ... i guess they want that to happen gradually rather than forcing the issue and creating reactions ... businesses like stability and assurances to start investing again - until then there wont be a lot of dollars for the FED to harvest.
" Inflation is dead –, There is no inflation rise around the corner as long as the internet is keeping the prices down and companies like Amazon, AIRbnb, Uber etc are keeping consumer prices lower ... Despite high levels of employment, Inflation stays mysteriously low – the fed will raise one more time and will watch what happens !" Go figure ... he sort of makes sense to me. It's a revolution of sorts. We should enjoy the low prices and low interest rates while they are here. We might end up paying dearly in the coming decades but there's nothing we can do about it. One problem the Fed has is there's no past history for the position they are in. They could start slowly running bonds off the books. All they need is market feedback to find out what will happen. It could be a mild response, on the other hand they are probably dreading a full scale collapse. They know they need to do something but they are moving in slow motion.